Please Support My Indiegogo Campaign . 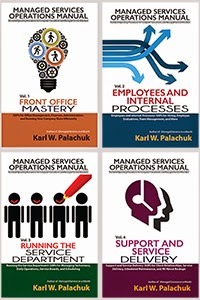 . .
And Receive a 4-volume Set of Books on Standard Operating Procedures for I.T. Consultants! Who needs Standard Operating Procedures (SOPs)? Everyone! My Indiegogo campaign is here: http://www.indiegogo.com/projects/sops-for-the-successful-consultant. Every computer consultant, every managed service provider, every technical consulting company - every successful business - needs SOPs! One of the greatest books an entrepreneur can read is The Emyth Revisited by Michael Gerber. The conclusion of that book is very powerful: Document your processes. When you document your processes and procedures, you design a way for your company to have repeatable success. And as you fine-tune those processes and procedures, you become more successful, more efficient, and more profitable. Almost every consultant I talk to or coach has the same issues: They need better procedures. They need better processes. They are too busy to create this stuff from scratch. Key pieces of knowledge are in one person's head (often the owner). That ties the owner to the company and limits growth. It also makes the owner the choke-point for everything in the organization. 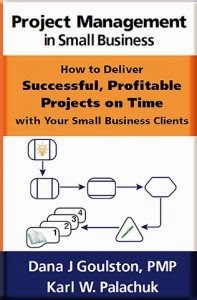 This four-book set will be over 600 pages and cover everything you need to set up, run, and fine-tune a great consulting business. Don't Start From Scratch! You may not implement everything exactly as I lay it out, but I discuss the issues and why you might create one policy or another. Then I propose some policies you can take and mold to fit your company. Can you do all this yourself? Absolutely! How's that working so far? These books will save you hundreds - and more likely thousands - of dollars in just a few weeks. Time and time again I've helped businesses create small changes that resulted in huge instant increases in profit. At full price this set will sell for $99.95. But you don't have to pay that. Contribute now to this campaign and you'll receive a full set of books for any donation of $60 or more. If fully funded, I expect to publish this set by the end of Summer 2014. Maybe much sooner if we raise more money. Get these books out of my head and into your hands as quickly as possible! If you just want to donate money, I would be very grateful for that. But this campaign is designed to give you something for your money. These books will sell for $29.95 each or $99.95 for the complete set. That's a good deal. But you get an even better deal if you contribute to the creation of the book! In addition to books, I have lots of other services and goodies we offer. So I've put together some offerings that include all kinds of options. If you think of something obvious that I missed, please let me know! Please check out my Indiegogo Campaign for SOPs.